Mykhailo Vinichuk is Professor in Ecology, Zhytomyr State Technological University, Zhytomyr, Ukraine. His research interests are behavior of radionuclides in both natural (forest, peatland) and agricultural ecosystems with special emphasis on the role of ectomycorrhizal fungi in radionuclides transfer. Klas Rosén is Associate Professor at Department of Soil & Environment, Swedish University of Agricultural Sciences SLU, Sweden. His research interests are both in terrestrial radioecology and radiation safety with various countermeasures in agricultural, forest and urban areas. This study focuses on the distribution of radiocesium (137Cs) and selected metals in soil fractions and soil fungi of boreal forest ecosystems. The accumulation of selected metals in soil fractions: bulk soil, rhizosphere, soil-root interface and fungal mycelium and sporocarps of mycorrhizal fungi were compared in a Swedish forest. Special attention is given to radiocesium released into the environment as a result of nuclear weapons testing and the Chernobyl accident in 1986, and alkali metals, potassium (K), rubidium (Rb), and cesium (133Cs), whose chemical behavior can be expected to be similar to 137Cs. The behavior of 137Cs in forest ecosystems differs from other ecosystems due to the abundance of fungal mycelia in soil, which contribute to the persistence of the Chernobyl radiocesium in the upper horizons of forest soils, as the fungi enhance uptake of these elements into host plants. Even many years after fallout, people in Sweden consume wild fungi and game obtained from these contaminated forests. Substantial research has been conducted in Sweden after the fallout from nuclear weapons testing and the Chernobyl accident and some results presented in this book are published in a series of several articles and book chapters in collaboration with Profs K. J. Johanson, H. Rydin, and Dr. A. Taylor (Vinichuk et al. 2004; 2010a; 2010b; 2011a; 2011b). Fungi are effective in accumulating a wide range of metals, as well as radioactive isotope 137Cs. Many trace elements, including some micronutrients, such as mercury (Hg), lead (Pb), cadmium (Cd), copper (Cu), nickel (Ni), and cobalt (Co) are generally considered the most toxic, and numerous studies indicate accumulation of metals by fungal sporocarps (Mietelski et al. 2002; Campos et al. 2012). However, the contribution of wild growing mycelia and soil fractions, such as the rhizosphere and soil-root interface, with metal accumulation and distribution within forest soil is not well studied. Therefore, we attempted to quantify the uptake and distribution of selected metals in the soil-mycelium-sporocarps compartments in various transfer steps: bulk soil, rhizosphere, soil-root interface, fungal mycelium, and sporocarps. The relationships between the concentrations of metals studied in bulk soil, soil mycelia, and fungal sporocarps were estimated. The 137Cs activity concentration and mass concentration of alkali metals K, Rb, and 133Cs were also analyzed within individual Sphagnum plants (down to 20 cm depth) in boreal ombrotrophic bogs in the northern hemisphere. The distribution of Cs (133Cs and 137Cs), K, and Rb in the uppermost capitulum and subapical segments of Sphagnum mosses were compared to determine the possible mechanisms involved in radiocesium uptake and retention within Sphagnum plants. 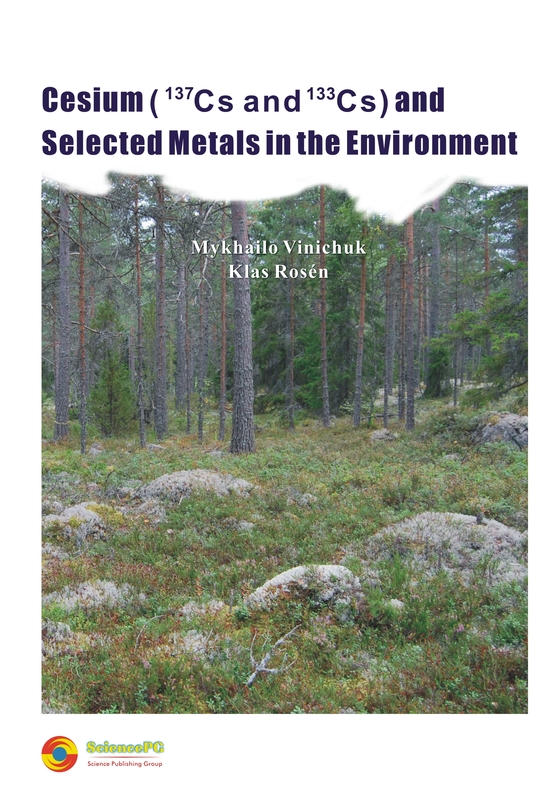 This book attempts to summarize the knowledge acquired from studies within Sweden and to place them in a larger context, and to update data on metals concentrations in fungal compartments of forest soil, especially in wild growing mycelium. The discussion of the summarized results addresses the issues of radiocesium (137Cs) activity concentrations, K, Rb, and stable 133Cs concentrations in soil fractions, fungal compartments and Sphagnum plants (Chapter 2); alkali earth metals calcium (Ca) and strontium (Sr) (Chapter 3); transition metals chromium (Cr), cobalt (Co), nickel (Ni), copper (Cu), zinc (Zn), cadmium (Cd), mercury (Hg), and lead (Pb) (Chapter 4); semimetals arsenic (As) (Chapter 5); and, actinides thorium (Th) and uranium (U) (Chapter 6). To place the work into a context, a short description of the study area, study design, and methods used is presented.